Scottsdale is officially known as the “The West’s Most Western Town” and is a city invested in living well. The people of Scottsdale care deeply about the outdoors, nature and hiking as well as art. In fact, it’s nearly impossible to travel more than a block or two in downtown Scottsdale without seeing a beautiful fountain, statue or art installation. For the true art enthusiast, I’ve come up with a recipe for a perfect day in Scottsdale exploring the art, wine, museums, galleries and even a bloody Mary work of art. There is no better way to start a day than a delicious breakfast. Hash Kitchen offers comfort food and Arizona’s largest Bloody Mary bar. How can you go wrong? The restaurant concept was inspired by the Bloody Mary and you’ll find a great assortment of vodkas, gin and tequila, including house infused liquors with garnishes to add to your beverage. 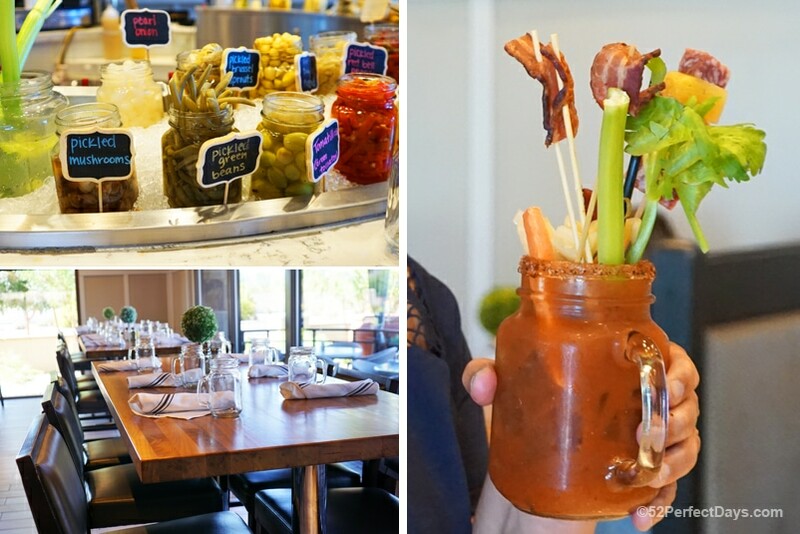 Once your Bloody Mary base is made, you then peruse the toppings bar, where you can choose from 50 toppings during the week and a whopping 70 toppings on the the weekend. The food is scrumptious and fun. You’ll find a lot of dishes for both a sweet or savory taste bud. I tried one of their signature hash dishes; the Huevos Rancheros with carna asada hash served over a base of crispy potatoes, topped with two eggs and served with a warm buttermilk biscuit. I was a happy camper. Some of the favorite sweet brunch entrees include banana split brioche French toast and Oreo pancakes. Scottsdale is a city that cherishes art. You’ll find 95 permanent pieces of public art and a dozen more temporary art pieces throughout the city. Scottsdale’s downtown is the only place in the world you can find a bridge designed by Paolo Soleri (1919-2013), one of the Valley’s most important artists. The Soleri Bridge, Plaza and Goldwater Bell are a must visit. The bridge and plaza are a combination of a pedestrian walkway, solar calendar and Goldwater Bell assembly located near the Scottsdale Waterfront. The Soleri Bridge links the south side of the Arizona canal to the Soleri Plaza on the north. The bridge is anchored by two 64-foot pylons situated at a true north axis and the bridge is intended to mark solar events produced by the sun’s shadow. As well as showing a daily beam of light at a certain time, each summer solstice (June 21st) when the sun is highest in the sky there is no shadow is cast. Each winter solstice (December 21st) when the sun is lowest in the sky, the shadow is the longest, reaching to the bridge structure. At one end of the plaza you’ll find the Goldwater Bell assembly, which Soleri himself cast in 1969. 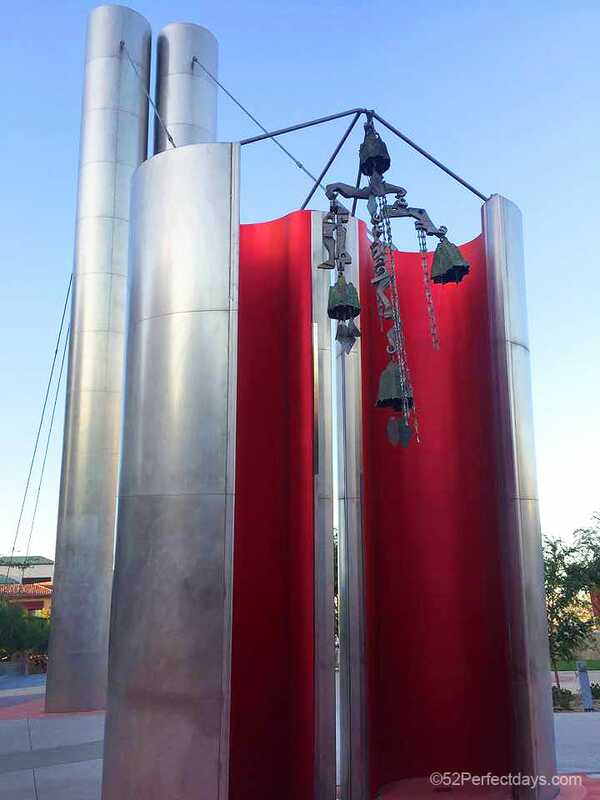 The Goldwater Bell assembly reflects the artist’s life work in architecture and ecology. 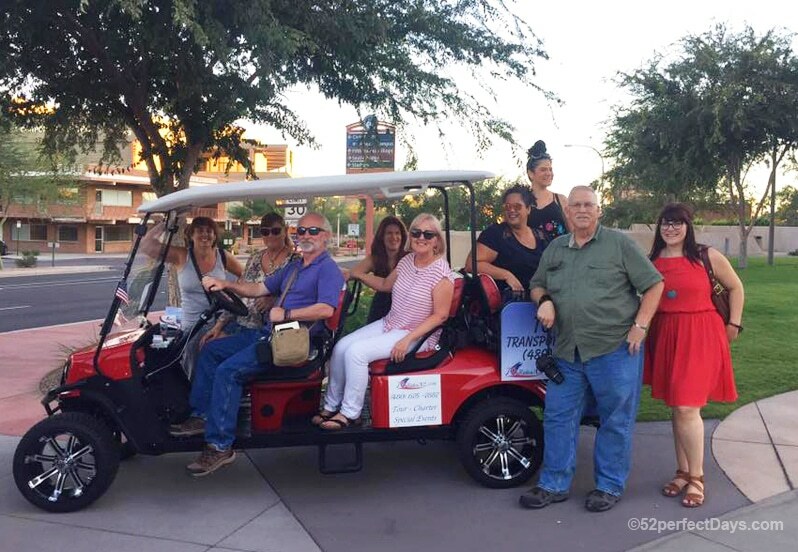 One of the best (and fun) ways to get a feel for Scottsdale is a JoyRidesAZ golf cart tour. Tour themes include culinary, historic, urban, craft beer, whisky and sunset. During our visit, we requested a customized tour that included Old Town Scottsdale, the Waterfront District, Art District as well as focusing on Scottsdale art history and public art. Tours are guided and last about 60-minutes. Our guide showed us downtown Scottsdale’s hidden gems as well as sharing history about Scottsdale and it’s art culture. There is nothing like learning about a location from a local. 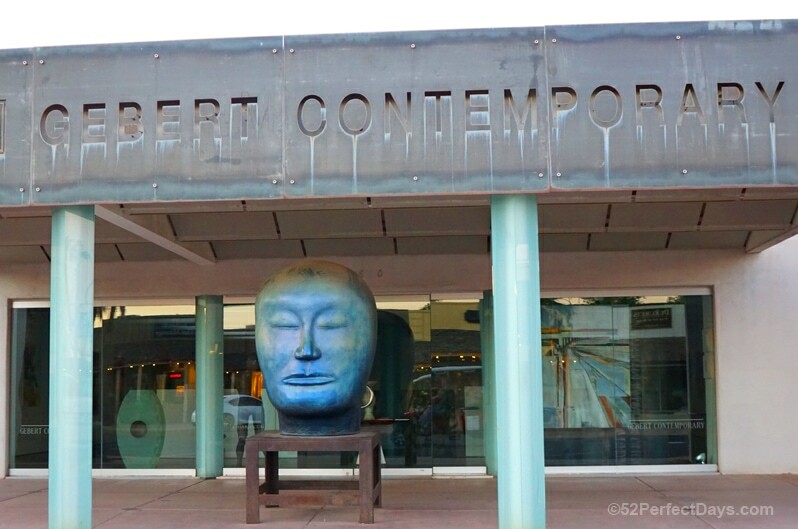 Scottsdale is home to more than 80 art galleries. You’ll find dozens of galleries in the historic Arts District, located on Marshall Way and Main Street. This area is best explored by foot and the best time to visit is for Thursday night ArtWalk. The ArtWalk is a free event that takes place from 7-9 PM. You’ll find everything from Native American art, art celebrating the West, as well as contemporary art at the many galleries in the district. One of the most unique galleries is Cosanti, which features the art and foundation of Paolo Soleri. At one point, Soleri was a disciple of Frank Lloyd Wright and trained at Taliesin. Soleri is known for organic architecture and experimental earth-formed concrete structures. He is the creator of the Soleri Windbells, which are famous around the world. If you have a fascination with art or architecture, this is a stop that should not be missed. There is no charge to visit and you can stroll freely around the property and workshops. You’ll find 150+ art galleries, art dealers, and museums within Scottsdale. From Frank Lloyd Wright’s Taliesin West, to the Scottsdale Historical Museum, Western Spirit: Scottsdale’s Museum of the West and the Museum of Contemporary Art, you’ll find something for every art lover. If you haven’t visited Arizona recently, you may not know they are producing some really good wine in Cochise County in the Southeastern Arizona wine region. One of the most talked about wineries is Carlson Creek, which planted their first vine in 2009 and has been producing wine ever since. 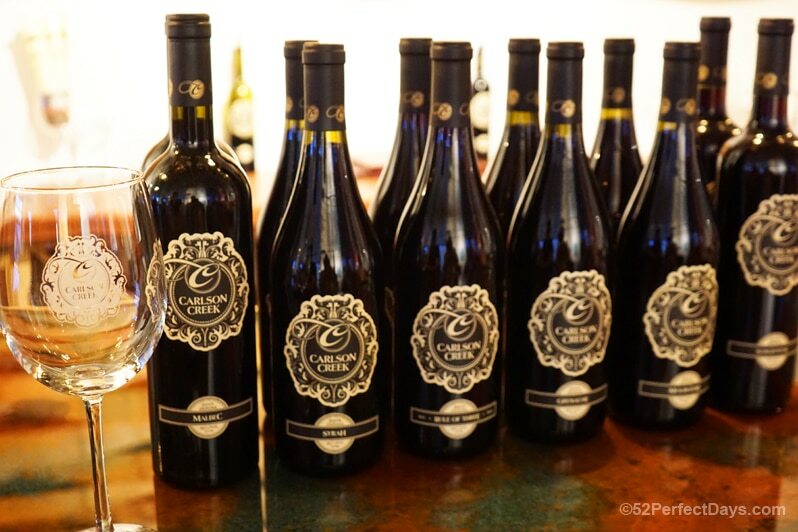 After a long day of exploring the Scottsdale art scene, head to the Carlson Creek tasting room to try a wine flight of their 100% Arizona, almost entirely estate grown wines that include varietals of Chardonnay, Sauvignon Blanc, Riesling, Syrah, Sangiovese, Cabernet Sauvignon, Grenache, Grenache Rosé, Malbec and Mourvèdre. My favorite website to find the best hotel deals is Hotels Combined. They guarantee to find you the best hotel price by searching through Booking.com, Expedia, Hotels.com, Agoda, Venere, LateRooms and more. If you find a cheaper rate after you’ve booked with a site listed on Hotels Combined, they’ll refund you the difference. I love this! It’s like Kayak for hotel rooms. Click here to search Hotels Combined for Scottsdale Hotel Deals. I also suggest looking into Airbnb. You can rent a luxury estate with a huge backyard with a resort pool, huge hot tub and blue crystal fire pit for as little as $175 per night. 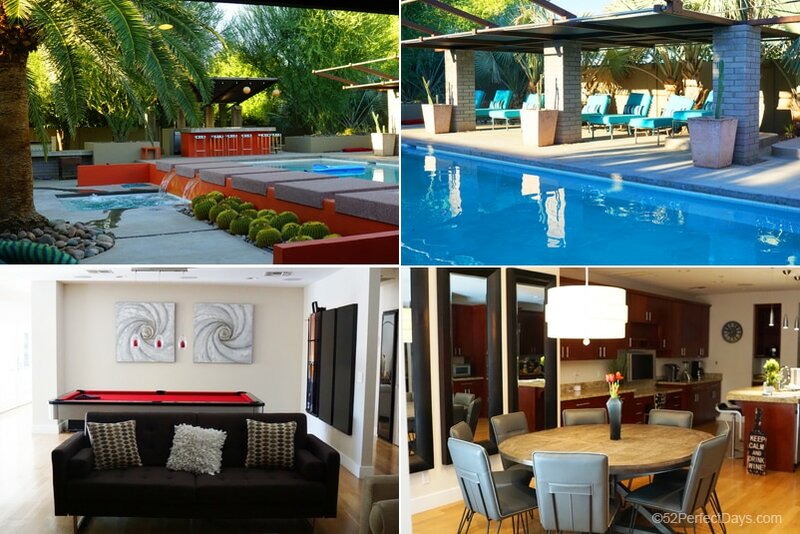 For additional luxury home rentals in Scottsdale, you can check out The Platinum Experience. If you’re interested in Airbnb and have never used it before, you can use this link to save $40 on your first Airbnb booking. Scottsdale’s coldest month is December with a high of 65°F and low of 42°F. In July, the warmest month, the average day time temperature rises to 104°F with an average low around 87°F. Winters are cool, and you’ll find mostly clear skies year round. I visited in late September and found the weather perfect for my liking, with a low of 53°F and high in the low 80’s. If you enjoyed this article about a Day Exploring Scottsdale Art and Culture, you’ll also love DeGrazia Gallery in the Sun: A Photo Essay. How to get there: Scottsdale is located in the Arizona Sonoran Desert. It’s less than 15 miles to Phoenix and sits just west of the McDowell Mountains. The best airport to fly into when visiting Scottsdale is Phoenix Sky Harbor International Airport (only 9 miles to Scottsdale). Pick up the Insiders Guide to Scottsdale and the 2018 Scottsdale Restaurant Guide. 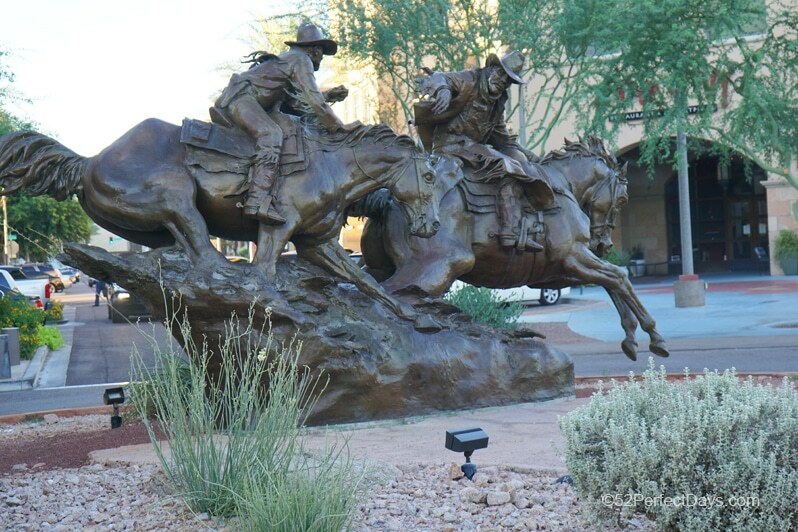 Get a good quality mirrorless camera for getting amazing photos of the art in Scottsdale. I use the Sony Alpha a6000 . Make sure to bring a water bottle because drinking a lot of fluids is very important when visiting the desert climate of Scottsdale. Bring a good sunscreen. Even in winter, you’ll need to lather up. I love Neutrogena SPF 45. A huge thank you to Experience Scottsdale for their generous hospitality when I visited and helping to coordinate the trip. As always, all opinions are our own. I haven’t spent much time exploring Arizona and need to. It is such a beautiful state and your post confirms all the good things I’ve heard about Scottsdale. Brunch at Hash and the golf cart culture tour are now at the top of my AZ list. I know there was more to this than the wine, but AZ has never even crossed my mind as a wine destination or even a producer. I’m heading to AZ in two weeks and may need to seek some out! This is the second Scottsdale post I read on the “Free For All Friday” thread. Something is pushing me to go! Everything looks lovely. Gosh, that brunch! Love!